Splendid Cinema proudly presents the new film from Takashi Miike, Hara-Kiri. 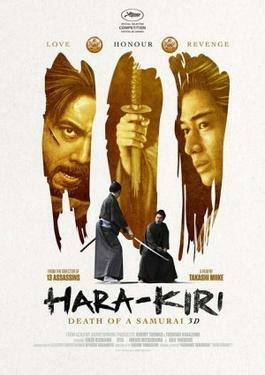 Splendid Cinema presents Hara-Kiri, the new film from Takashi Miike on October 7th at 7:30pm at Worcester Arts Workshop. Hara-Kiri (Death of a Samurai) tells the hauntingly beautiful tale of honour, revenge and love which is more subdued than Miike’s usual work with a deeply dramatic and emotional tone. Miike takes his time to develop the story before the film explodes into a glorious sword fight scene much like the magnificent battles seen in his last film, 13 Assassins. Also like 13 Assassins, Miike still shows real flare for capturing Japanese history and culture with some gorgeous cinematography, whilst still keeping the visceral action sequences- think Unforgiven with swords. Miike presents his own take on a traditional samurai tale, but those who are unfamiliar with them are in for a treat with Miike’s quiet and assured film. Don’t believe us? Here’s the trailer! Hara Kiri (Japan, 2011, Takashi Miike) 126 min. 18 Cert. Splendid Cinema opens its new season with A Dangerous Method. Splendid Cinema presents A Dangerous Method, the new film from David Cronenberg, 23 September at Worcester Arts Workshop at 7:30PM. David Cronenberg explores the pioneering work of Jung and Freud in the early days of psychoanalysis in this enthralling and provocative drama. Drawn from true life events, A Dangerous Method explores the turbulent relationships between budding psychiatrist Carl Jung, his mentor Sigmund Freud and the beautiful and captivating Sabrina Spielrein who comes between them when she an Jung start a love affair. With sublime performances from Fassbender, Mortensen and Knightly, the success of both of A History of Violence and Eastern Promises behind Cronenberg, and with this being the third consecutive collaboration between him and Mortensen the film received high praise from critics, so this promises to be a captivating watch. For more information on any of our films, please contact Mikel Koven at splendidcinema@live.co.uk, follow our blog (https://splendidcinema.wordpress.com)or look for us on Facebook. 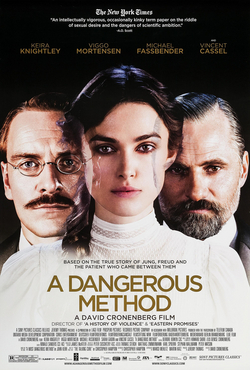 A Dangerous Method (Canada, 2011, David Cronenberg) 99 min. 15 Cert. Here are the details of the new Splendid Cinema season, along with trailers to whet your appetites! 23 September: A Dangerous Method (David Cronenberg, 2011, Can): David Cronenberg’s adaptation of Christopher Hampton’s stageplay about the falling out between Freud and Jung over a female patient, played remarkably well by Keira Knightly. Viggo Mortensen is Freud & Michael Fassbender is Jung – and both give truly wonderful performances. 7 October: Hara-Kiri (Takeshi Miike, 2012, Jap): The never-predictable Takeshi Miike returns to the samurai genre after last year’s 13 Assassins with a very different movie. If 13 Assassins was Miike’s Seven Samurai, then Hara-Kiri is his Rashomon: a quiet and mannered film about duty and revenge. 28 October: Rabies (Aharon Keshales & Navot Papushado, 2010, Israel): Who says horror films can’t be intellectual? In a deserted nature reserve people are being hunted down one by one, but is it single psycho-killer on the loose or is there just something wrong with the land? 11 November: Chico & Rita (Tono Errando, Javier Mariscal & Fernando Trueba, 2010, Cuba): Possibly the most romantic film made in the last decade! This gorgeous animated film from Cuba tells of the love and career of two 1950s jazz musicians in Havana, and how success destroys their relationship. 25 November: The Lady (Luc Besson, 2011, France/UK): French blockbuster director Luc Besson directed the amazing Michelle Yeoh as Burmese human rights activist Aung San Suu Kyi in this remarkably inspiring and moving biopic. David Thewlis co-stars. 9 December: Silent Night, Bloody Night: The Homecoming (James Plumb, 2012, UK) Director in attendance. The abandoned home of Wilfred Butler, a wealthy but troubled man who committed suicide in 1987, has been willed to his grandson, Jeffrey. Just before Christmas 2012, many years after Wilfred’s death, Jeffrey and his lawyer appear in town to negotiate the sale of the property. But an Axe wielding maniac has set up residence in the house, and he doesn’t take kindly to strangers.